Kegco's K199B-1NK Single Tap Full Size Keg Beer Dispenser houses your kegs in an all-black cabinet with an elegantly designed field-reversible black door, and comes with a single faucet draft tower. Two removable wire shelves allow you to easily convert this beer fridge into an all-refrigerator or beverage center when you need extra refrigerated storage space for food and other beverages. Thanks to 2-1/2" casters, you can move this kegerator into any room in your home, allowing you to serve your favorite ice cold draft beer in your kitchen, home bar, or dining room. 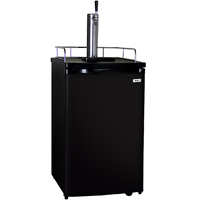 Specially designed for use in the home, this keg cooler boasts ultra-quiet performance and an energy-efficient design. Additional convenience features include a removable drip tray that collects drips and spills for easy clean-up, a steel interior floor mat that ensures long-lasting durability, and an attractive metal guard rail that allows you to store mugs and glasses on the textured counter-top. This keg refrigerator can hold one full size, straight pony, or quarter slim keg, and up to two sixth slim, strap handle, or rubber home brew kegs. PLEASE NOTE: It will not fit bevel or rubber kegs that are wider in the middle than at the top or bottom. These are commonly used by Coors and Miller brewing companies.